Employment was little changed in August (+22,000 or +0.1%). The unemployment rate declined by 0.1 percentage points to 6.2%, matching the most recent low of October 2008, the month prior to the 2008-2009 labour-market downturn. An increase in the number of people working part time (+110,000) was mostly offset by a decline in the number of people employed full time (-88,000). While the increase in part-time employment was spread across the age groups, most of the decrease in full-time employment occurred for youth aged 15 to 24. The overall employment decline for youth was accompanied by a notable decrease in their labour force participation. In the 12 months to August, employment rose by 374,000 (+2.1%), with gains in both full-time (+213,000 or +1.5%) and part-time work (+161,000 or +4.6%). Over this period, the number of hours worked increased by 2.2%. From July to August, there were more employed men and women aged 55 and older. In contrast, there was a decline in the number of employed youths aged 15 to 24. Employment held steady for the core-aged demographic group of 25- to- 54 year-olds. Provincially, Ontario was the lone province with a notable employment gain in August. Employment declined in Nova Scotia and was little changed in the other provinces. In August, more people were working in finance, insurance, real estate, rental and leasing as well as in transportation and warehousing. At the same time, employment fell in manufacturing, in the "other services" industry and in natural resources. There were more self-employed workers in August, while the number of employees was little changed in both the private and public sectors. For men aged 55 and older, employment increased by 28,000 in August after five months of little change. The unemployment rate for men in this age group rose by 0.3 percentage points to 5.6%, the result of more people participating in the labour market. Compared with 12 months earlier, employment for men aged 55 and older increased by 85,000 (+4.1%). Employment for women aged 55 and older increased for the third consecutive month, up 20,000 in August. The unemployment rate for this group was 5.1%. Compared with 12 months earlier, employment for women aged 55 and older grew by 75,000 (+4.4%). Among workers aged 55 and older, about 8 in 10 are between the ages of 55 and 64. The estimated year-over-year employment growth rate (unadjusted for seasonality) for 55- to- 64-year-olds was 3.4% in August, and their population increased by 2.0%. While population growth was similar for men and women in this age group, employment grew at a faster pace for women (+4.5%) than for men (+2.5%). In comparison, people aged 65 and older comprise a smaller share of older workers, but they had the fastest year-over-year employment growth rate (unadjusted for seasonality) among the major demographic groups in August, rising 9.2% and outpacing their rate of population growth (+3.7%). Among this group of workers, employment grew at a faster pace for men (+10.8%) than for women (+6.8%). For more information about recent trends among older workers, see "The impact of aging on labour market participation rates." Youth employment fell by 33,000 in August, as a decline in full-time work (-66,000) was partially offset by an increase in part-time work (+33,000). The overall employment decline for youth was accompanied by a notable decrease in their labour force participation. The youth unemployment rate was 11.5% in August. Compared with 12 months earlier, youth employment was little changed. Employment for people aged 25 to 54 held steady in August and the unemployment rate fell by 0.2 percentage points to 5.4%, as fewer men and women in this age group looked for work. Compared with 12 months earlier, employment among the core-aged population rose by 195,000 (+1.6%), with most of the gains occurring from October 2016 to March 2017. In Ontario, employment rose by 31,000 in August, the third increase in four months. The unemployment rate fell 0.4 percentage points to 5.7%, the lowest level since January 2001. Compared with August 2016, employment in Ontario was up by 154,000 (+2.2%) and the unemployment rate was down by a full percentage point. 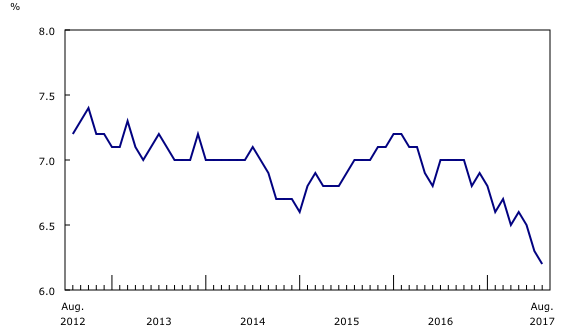 Overall employment in Quebec was little changed for the second consecutive month. In the 12 months to August, employment in the province rose by 93,000 (+2.3%), with nearly two-thirds of this increase in full-time employment. Over the same 12 month period, the unemployment rate fell 0.9 percentage points to 6.1%. In Alberta, employment held steady in August and the unemployment rate edged up to 8.1%, as more people searched for work. Compared with 12 months earlier, employment in the province rose by 34,000 (+1.5%), with nearly all of the increase in full-time work. The added employment over the same period was driven by gains in transportation and warehousing, manufacturing and natural resources. In August, there were 5,600 fewer employed people in Nova Scotia, leaving employment for the province at about the same level as 12 months earlier. With the employment decline in August, the unemployment rate in Nova Scotia rose by a full percentage point to 8.9%. Employment in New Brunswick was little changed for the seventh consecutive month. However, the unemployment rate increased by 1.3 percentage points to 7.8% as more people searched for work. Compared with August 2016, employment in New Brunswick remained relatively unchanged and the unemployment rate fell by 1.5 percentage points. Employment in finance, insurance, real estate, rental and leasing rose by 15,000 in August, bringing gains from 12 months earlier to 47,000 (+4.2%), with most of this increase concentrated from September 2016 to January 2017. 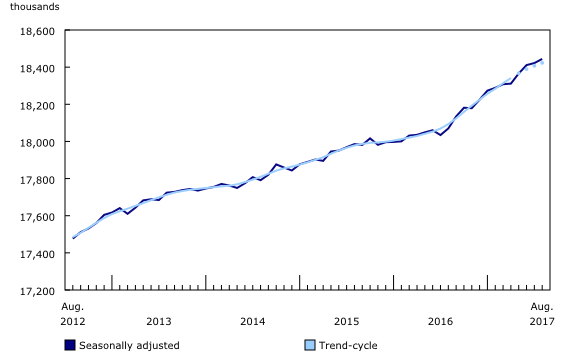 The additional employment in August was mainly in Ontario. In August, employment increased by 9,800 in transportation and warehousing, continuing an upward trend that began in February 2016. On a year-over-year basis, employment in this industry increased by 44,000 (+4.8%). The number of people working in manufacturing fell by 11,000 in August, mostly offsetting the increase from the previous month. 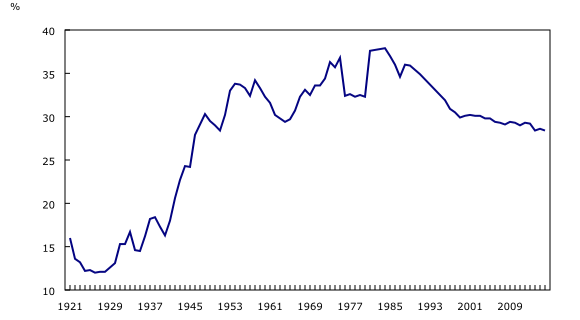 The decline in August was largely in Quebec. Compared with 12 months earlier, national employment in this industry was up by 40,000 (+2.3%), mostly the result of gains since February 2017. Employment in the "other services" industry declined by 11,000 in August, continuing a downward trend that began at the start of 2017. "Other services" include services related to civic and professional organizations, as well as repair and maintenance services. The number of people employed in natural resources declined by 7,700 in August, offsetting the increase from the previous month. Following steep declines from April 2014 through the summer of 2016, employment in the industry has slowly trended up. The number of self-employed workers rose by 33,000 in August, contributing to year-over-year gains of 101,000 (+3.7%). The number of employees in both the private and public sectors was little changed in August. Compared with 12 months earlier, the number of private sector employees increased by 196,000 (+1.7%), while public sector employment rose by 77,000 (+2.1%). For returning students aged 15 to 24, average employment for the summer (that is, from May to August) increased by 47,000 (+4.1%) compared with the summer of 2016. Most of the growth was in Quebec (+33,000). At the national level, the largest increase was in retail and wholesale trade (+28,000), followed by manufacturing (+13,000), health care and social assistance (+9,000), and information, culture and recreation (+7,000). The average employment rate for students aged 15 to 24 in the summer of 2017 was 50.5%, up 1.8 percentage points from 2016. Over the same period, the average unemployment rate declined from 15.6% in 2016 to 14.3% in 2017. Among students aged 20 to 24, average employment increased by 14,000 (+2.8%) in the summer of 2017 compared with the previous summer. Their employment rate was 65.5% in 2017, little changed from the summer of 2016 and their unemployment rate stood at 9.0%, also little changed. In the summer of 2017, average employment growth was particularly strong among students aged 17 to 19 (+26,000 or +5.5%) compared with the previous summer. The average employment rate for this group of students was 57.3% in the summer of 2017, up from 55.1% the previous summer. Their average unemployment rate was 13.8%, down from the rate of 15.3% in the summer of 2016. Among 15 and 16 year-old students, employment was little changed in the summer of 2017 compared with the previous summer. Their employment rate was 26.2% in the summer of 2017 and their unemployment rate stood at 26.8%. Adjusted to US concepts, the unemployment rate in Canada was 5.3% in August compared with 4.4% in the United States. In the 12 months to August, the unemployment rate fell by 0.6 percentage points in Canada and by 0.5 percentage points in the United States. The labour force participation rate in Canada (adjusted to US concepts) was 65.7% in August, compared with 62.9% in the United States. On a year-over-year basis, the participation rate increased by 0.2 percentage points in Canada, while it edged up 0.1 percentage points in the United States. The US-adjusted employment rate in Canada stood at 62.2% in August, compared with 60.1% in the United States. On a year-over-year basis, the employment rate rose by 0.6 percentage points in Canada and by 0.4 percentage points in the United States. Labour unions have long played an important role in shaping Canada's labour market, and have had a significant impact on the overall performance of the Canadian economy. At the beginning of the 20th century, union membership was uncommon, partly because of a labour surplus associated with mass immigration. Following the tumultuous events of the 1910s—including the First World War and the 1919 Winnipeg General Strike—the rate of union membership had risen to 16.0% by 1921. This rate almost doubled to 30% by the late 1940s, driven by the growth of manufacturing, labour scarcity during the Second World War, and the post-war economic boom. In the 1950s and 1960s, legislation recognizing unions and protecting collective bargaining rights contributed to a further increase in unionization rates, which reached a high of 38% in the mid-1980s. In 1997, when the Labour Force Survey first collected data on union membership, just under one-third of employees (30.9%) were in a union. This proportion trended downwards over the next 20 years, reaching 28.4% in 2016. From 1997 to 2016, unionization fell in the private sector (from 19.0% to 14.6%) while it increased among public sector workers (from 69.8% to 73.0%). The decrease in unionization in the private sector was due in part to structural employment changes, from industries with traditionally-high rates of union organization to those with lower rates of unionization. 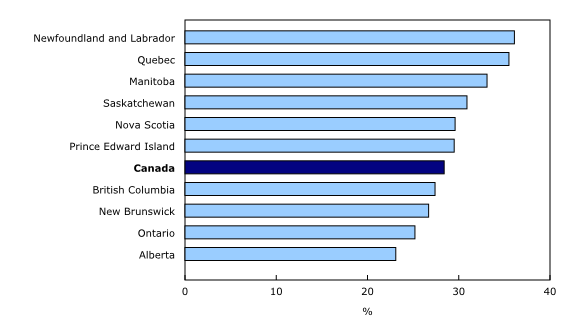 In 2016, the unionization rate was highest in Newfoundland and Labrador (36.1%) and lowest in Alberta (23.1%). Sources: "One hundred years of labour force" in Canadian Social Trends (Catalogue number11-008-X), "Unionization rates falling" in Canadian Megatrends (Catalogue number11-630-X) and CANSIM table 282-0223. On 1 January, 2016, the world officially began implementation of the 2030 Agenda for Sustainable Development—the United Nation's transformative plan of action that addresses urgent global challenges over the next 15 years. The plan is based on 17 specific sustainable development goals. As a result of forest fires, Labour Force Survey (LFS) data were not collected from some respondents in a small number of communities in British Columbia in August. The impact on estimates for Canada, British Columbia and the economic region of Cariboo is minimal. The LFS estimates for August are for the week of August 13 to 19. The next release of the LFS will be on October 6. A more detailed summary, Labour Force Information (Catalogue number71-001-X), is now available for the week ending August 19. The updated Labour Market Indicators dashboard (Catalogue number71-607-X) is now available. This new, interactive dashboard provides easy, customizable access to key labour market indicators. Users can now configure an interactive map and chart showing labour force characteristics at the national, provincial or census metropolitan area level. To enquire about the concepts, methods or data quality of this release, contact Vincent Ferrao (613-951-4750; vincent.ferrao@canada.ca), Andrew Fields (613-951-3551; andrew.fields@canada.ca) or Client Services (toll-free 1-866-873-8788; statcan.labour-travail.statcan@canada.ca), Labour Statistics Division.